I still think about my ex and want to get back together! I know that a breakup can often leave a mark and conjure up a feeling of rejection that doesn’t really match the spirit of getting back together. You want to forget the person that you had been with for years. You want to stop hurting because of the breakup and you don’t want to think about your ex all the time anymore. So, you decide to turn the page once and for all. It isn’t always easy to let go of the years you had spent together and to forget about everything you had felt. You can feel like you’re being pulled back and forth between love and bitterness towards your ex-partner. There might also be a “technical difficulty…” Your ex doesn’t want to leave you alone and sometimes, even if they’re the one that decided to separate, they can remain present and hold you back from moving on. Sometimes they still want to spend time with you and this blocks you from rebuilding yourself as this tends to conjure up doubts. This situation is becoming more and more unbearable. And you are still missing him/her everyday. What do you do when “I don’t want to think about my ex anymore?” how can you move on without suffering too much? Is it really possible to forget your ex ? 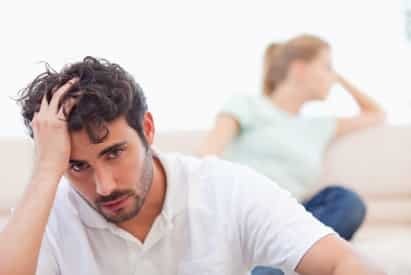 Discover the answers to your questions in this article that’s going to help you to move on for good, or, it can also help prepare you to get back with your ex in a healthy and stable way. You keep seeing people on the street that look like your ex, you see the same car they drive all the time, and it seems like every character you see in a movie has the same name as them. Sometimes it feels like someone’s playing a cruel joke on you. It’s therefore completely normal that you’d be thinking like this and that you would notice all the things that you weren’t seeing before. Nevertheless no one is trying to play a trick on you, there is no conspiracy against your happiness. In simple terms, when a person really wants something, and in these circumstances, someone, they tend to see them everywhere. Your mind is fixating on the person that you love and no matter what you do, you can’t seem to get them out of your head. Unfortunately, you are no longer with the person you love and this sadness is profound. When you really want something you can become obsessed with it, it is constantly on your mind and can even make appearances in every day things. A pair of shoes or a piece of jewelry can remind you of them…not to mention the heartache you’re currently feeling. When you think about your ex all day, it’s because you want them back and you regret having broken up. In addition to your need to get them back, it’s important to note that spending very intense weeks, months, or even years with someone automatically results in your mind focusing on them day and night. Emotions develop, memories are created; it’s a beautiful love story that you are sharing. Unfortunately sometimes the relationship doesn’t quite progress in the way we would have liked, and it ends in a breakup. Separations are oftentimes unexpected, which is precisely what makes them so hard to cope with. Some men and women are able to move on and overcome the post-breakup heartaches very quickly. But it seems that this isn’t the case for you. You don’t want your love story to end on a false note. Getting back with your ex is the path that you’ve chosen. You should have no regrets, and you should be willing to try everything it takes to win back what was lost, in order to show this person that you love that you can move forward. Yet there is a roadblock, and your attempt at winning back your ex is not moving forward simply because the thought of the person conjures up deep sadness, and results in making certain mistakes. I can’t tell you how many times I hear “I still think about my ex or I still dream of being together when I coach people on a daily basis. What will have to happen is a transformation of these thoughts. They must be avoided or transformed into a source of motivation for the actions that you will have to carry out after a breakup. To learn how to go about doing this, read on. You think more about being in a relationship than about your ex! While you believe that you are thinking about your ex and I see more and more examples of this in the coaching sessions I do on a daily basis; you are actually thinking about the life as a couple that you feel passed you by instead of your ex. It’s not the person itself that you are missing; it is what they brought to your life, and a future that you could envision together. I don’t mean that your feelings aren’t genuine and that your desire to get them back isn’t sincere. I am simply saying that it’s very important to avoid putting your ex on a pedestal by thinking that you cannot live without them. After a breakup, emotional dependence is oftentimes manifested, even when we are unaware of it. You want to get back into the groove of things, feel happy again, you don’t like the single life, and you feel that your ex is the only person that can make you happy. Of course it’s not surprising that all your thoughts are focused on your ex. You imagine your future with this person, and no one else. This reveals a deep need to be in a relationship at any cost! Nevertheless, it isn’t with this frame of mind that you’re going to convince your ex to come back into your life. You must understand that it isn’t your ex that is haunting your every thought. It’s the desire and the need to be in a relationship. The moment you realize this, you will avoid making a large portion of typical mistakes, and you will steer clear of relationship-recovery “don’ts” such as harassment and pleading. Rest assured however, even if some of these harmful actions have already been made, it’s not too late to convince your ex to return. I still think about my ex but that alone won’t make them come back. As with any feeling, simply thinking about your ex will not be enough to boost your success at getting them back. You tend to stay locked up in your dreams and you hope that the ex that you love will just return, without you having to even lift a finger. Whether it’s because of pride, or maybe even a misunderstanding of some of the techniques needed to win back your ex, you let time work for you, or maybe you even think that all hope is lost. The fact that you’re thinking about your ex means a lot! Of course it’s not easy to just forget about someone with whom you shared intimate moments and memories. Even a place that you often visited together or the mention of their name can bring up a surge of emotion. But if you’re here with me today, you wish for more! This is a sign that your feelings are still present and that you must be ready to start certain initiatives to avoid having any regrets, and more importantly, to avoid remaining inactive. A big mistake that men and women often make is thinking that when trying techniques needed to win back your ex, it is enough to just be patient and wait, without making any effort to change the situation. You want them to come back to you more and more each day. This is precisely why it is time to take action! How can I forget my ex as quickly as possible? It’s never easy to want to forget the person you had loved, because those feelings can still be present. This is why you’re going to have to make some radical decisions if you don’t want to live in regret and to move on. With impactful actions you’ll be able to move forward. This of course will take some time and you’re not going to be able to turn the page for good within just a few days. Your actions must reflect your words and what you’re thinking. If they don’t, you won’t be able to move forward and you won’t feel any changes or improvements. Photos, your ex’s things… You have to return these things to them so that you can stop seeing things that remind you of them all the time; they conjure up emotions and heartache. As I explained in the beginning of this article, thinking too much about an ex can sometimes prevent you from taking action. A simple yet common example that I often see is the refusal to implement a radio-silence because you are afraid of offending, or pushing away your ex. You must understand that this action is vital and beneficial for your relationship, and it isn’t against your ex. A key step in winning back an ex is being able to rebuild oneself after the separation. A breakup leaves painful marks and so it’s perfectly normal to have a hard time bouncing back while also being able to get your ex out of your head. This is why you shouldn’t create a situation in which you are responsible for this issue. For example if you spend all day on your ex’s Facebook profile, if you are looking at photos of you together, if you keep their things at your place and you keep wearing their sweaters or shirts to bed; I’m sorry to put it so bluntly but you are being a facilitator in the sadness that you are feeling. You will have to take radical actions if you want things to change. You should delete your Facebook page if you are spying on your ex and therefore hurting yourself. Return their belongings to them instead of gazing at them all day, basking in the memories of your relationship. Doing this doesn’t necessarily mean that you are turning over a new leaf and not looking o get back together. On the contrary, these types of actions are preparing you to win back your ex by restoring confidence in yourself, and establishing your own independence. Is it a good idea to forget about my ex? In love, it’s very important to take your time with big decisions, and to never rush into something without properly thinking it through. I’m telling you this because it’s important that you don’t have regrets and so that you don’t have to come back to this site later on to learn how you can get them back. This happens pretty often and it makes things very complicated. People sometimes make decisions too fast and end up having to change their tactics (which isn’t a piece of cake, by the way.) It’s hard because it can give rise to some serious emotional dependence which in turn makes it easy to make big mistakes as your emotions are in control. He Says He Misses Me But Doesn’t See Us Together! Whether you want to get back together with your ex or forget about them, it’s imperative that you take the time to really think your decision through and to not be blinded by your emotions. For example, if you want to say goodbye to your entire relationship after a simple fight, I don’t recommend doing so. In fact you might end up wanting to go back to them the moment you find out they’re seeing someone new. If you give it a few days, you’ll be able to figure out the best possible decision you could make, and you’ll be able to start working on it. If you end up feeling like you don’t want to hear another word about your ex ever again, I will help you rebuild yourself and bounce back. While in the previous paragraph, I discuss the importance of spending time making the decision on whether or not to forget your ex, it’s important to realize that even if you want to get back with your ex again now or at a later date, forgetting about them first may be the right move (either way!). This is because when we move forward from our ex’s, we’re able to regain our self confidence and emotional control. When we move onward and upward from our exes, they stop having any sort of power over us! This in itself is HUGE! Why? Well, if you’re constantly asking yourself, “why can’t I stop thinking about my ex?”, it’s likely because you psychologically allow for the them to continue having some sort of power over you. When your ex is at the forefront of our minds, how will be able to use confidence to re-attract them organically? On the contrary! Our ex will see that we still have them on a pedestal, and this will only empower them and make them wonder if wanting us back is even a good idea! After all, who wants to invest in someone who believes them are “less than”. We want to invest in people who invest in themselves! Therefore, if you are wondering whether or not it’s a good idea to forget about your exif you still want your ex back, chances are it can actually help you get your ex back in the end. Once your ex no longer dictates how you feel, you can return to being who you were when they first met you. That’s the person they fell for! Brittney is a young woman I began working with about 8 months ago. When she first called, she was consumed by thoughts of her ex. The first thing she said was “I can’t stop thinking about my ex! I want my ex back! Help me!” The first thing we worked on during her Radio Silence period was how to help her STOP thinking about her ex and how to, instead, get her thinking about herself. This took months. Why? Because stopping to think about your ex is HARD WORK! That is why you’re on this site, though, right? We gave her to-do lists, and exercises, and over time, she stopped being driven by thoughts of her ex and was able to exert true and thorough emotional control over herself and her thoughts and feelings. After 2 months, her ex contacted her to reach out, JUST when she was about to forget about him completely. Through coaching, we prepped her for the meeting, and we both knew she was going to do great. After all, when you put in so much work, it’s hard NOT to knock the first meeting out of the park. Today, after a few more sessions of one-on-one coaching, they’re back together and better than ever. And this all started with her forgetting about her ex even though she originally wanted her ex back more than ever. This is one of the many stories we are able to share about why forgetting your ex may not be the worst plan in the world. Together, we’ll develop a game plan tailored to your unique situation and we’ll be able to monitor your progress as the weeks go one. We’d love to help you achieve your goals in love. You, like so many out there, deserve to feel satisfied in and with their relationships; and we love to help you on your journey back and beside the one you love. Your coach when your ex is ever-present in your thoughts.